Of the 2.5 million burglaries occur every year, around three-fourths of them are home break-ins. Only 13 percent of those reported burglaries are solved due to lack of evidence, so it’s clear that preventing burglary is really the best way to not take a loss. While this time of year is often a “slow” time for burglaries in most of the nation, with snow and cold weather acting as a deterrent to thieves, homes in Raleigh are still at risk due to our relatively mild climate. Plus, winter brings added opportunities for burglaries – it’s dark sooner, people go on vacation during the holidays, and homes are filled with the latest expensive gadgets they got for Christmas. To help you prevent a burglary, we compiled effective tips for home security in winter and throughout the year. Home break ins are most likely to occur in two situations: at night and when the resident isn’t home. Because it gets dark so early in winter, this gives thieves more opportunity to enter your home. 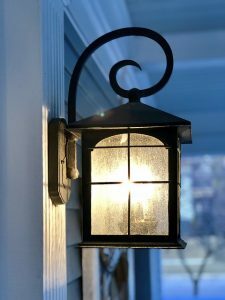 Keeping your property well lit with automated security lights is one of the most effective home security methods to deter theft, especially when paired with motion detecting lights. When setting up lights around your property, don’t forget your back yard. Even if you have a fence, in the dark, a thief can jump or climb the fence and get in through the back door or windows. Motion detecting lights on your garage, in the far corners of your property, and the back yard are just as important as the front of your property. After the holidays, there’s always an uptick in home break-ins, and often it’s because homeowners inadvertently advertise that they have the latest expensive technology in their home. When large television boxes, game console boxes, or laptop packaging is set out by the street for trash pickup, thieves can tell exactly what’s in your home without having to look in your windows or scope out the property. If you get expensive electronics or a high-value item, break down the boxes and even cut the cardboard so it will fit in an opaque garbage bag in your trash can. Better yet, take the boxes to a recycling center! If you have a garage attached to your house, it’s important to keep your garage as secure as you would your windows and doors. While it may seem difficult to break in through the garage door, it’s actually a quick task, and often goes unnoticed. First, never leave your garage door opener in your vehicle as that’s an easy way for thieves to get inside. Also, make sure you secure your garage door’s emergency release cord to prevent thieves from triggering it to open without a garage opener or code. Finally, make sure you install and use a deadbolt lock on the door from your garage to keep thieves from entering the house. Taking a much-needed winter break? While a lot of people love to share their up-to-the-minute vacation details on Instagram and Facebook, you’d be surprised how many thieves use social media to look for opportunities. Instead, save the pictures and details to post until after you get back home. Also, before you leave your home for a few days, arrange for your home to “look occupied.” This includes making sure you arrange a stop on your mail or newspaper delivery or see if your neighbor can pick it up while you’re gone. A few papers in the driveway and a stuffed mailbox are clear tip-offs that you aren’t home. Arranging for your driveway to be shoveled if there’s snow and bringing your trash can to and from the curb are also helpful ways to make your home look lived in. The best way to prevent a break in or stop a thief is a home security system. Studies show that burglars are 60 percent more likely to move on from a home when there is evidence of a security system. Camera systems, interactive safety and security features, plus video and mobile monitoring can not only prevent a break in from happening but it can also gather useful information to turn over to the police. If you want to ensure your home’s security and keep your family safe, we can help. With over 25 years of experience in installing, monitoring, and repairing residential and commercial security systems in Raleigh, we are experts in home security. We offer a wide selection of security services to meet any need or budget and offer complimentary consultations. To schedule your consultation with our security experts, reach out to us today at 919-957-9818 or fill out the contact form below!